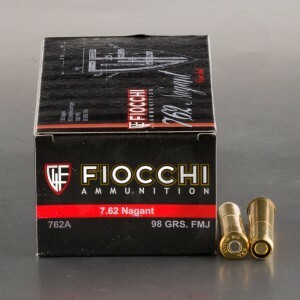 7.62 Nagant ammo is also referred to as 7.62x38mmR. The cartridge was the Soviet Union’s last service revolver cartridge to see use. The 7.62 Nagant is not to be confused with the 7.62x54R manufactured for the Soviet Mosin Nagant rifles. No, this ammo was created with an odd design, for an odd revolver. The 7.62 Nagant utilizes a bullet fully seated into the case, with the case crimped above the bullet. The revolver these rounds are fired from eliminates the gap between barrel and cylinder. This adds an additional 150 feet per second out of a revolver cartridge. This also means there is a gas seal the Nagant revolver is one of the few revolvers that can be utilized with a suppressor. A Nagant revolver fitted with a suppressor was found in the hand of Vietnam guerillas and is currently on display in the CIA headquarters. 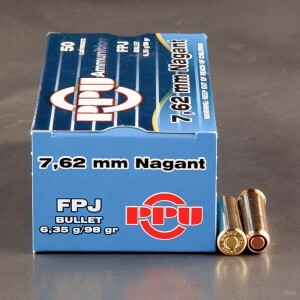 Great Nagant ammo way more punch than PPU and fit better in the cylinder as well! These guys shipped fast! I will be buying more! Great ammo. Groups very well (for this pistol). Little more kick then the other brand I have used before. Just hope ammo2go puts on sale again. I have purchased these in the past along with surplus ammo and see no significant difference in performance.